In Finland this delicacy is know as “lasimestarin silli”, direct translation being “glass master’s herring”. 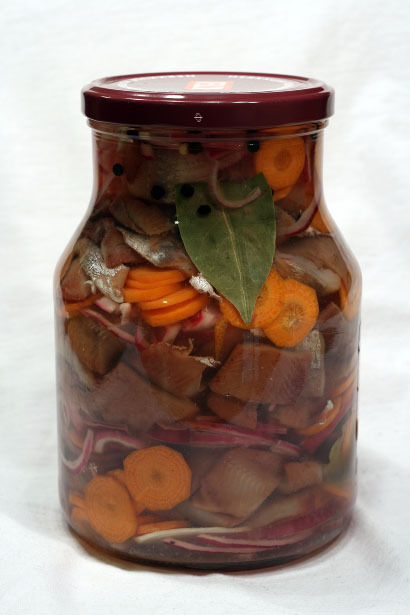 It is herring preserved in sugar and vinegar based liquid, and spiced with onions, carrots, horseradish and peppers. Pickled herring is enjoyed throughout the year, but especially during Christmas time. I’ve always loved pickled herring, especially ABBA kes?silli (summer herring) with new season potatoes. Many restaurants offer various, self made spiced and pickled herrings in their lunch buffets, but way too often I’ve found them to be slimy rather than delicious. A week ago my mum gave me a small jar of self made lasimestarin silli for a pre-xmas present. I was really surprised, since as long as I can remember, she has bought all herring products from stores. When I opened the jar and carefully tasted the herring, I was astonished as it was super delicious. Today I called her and asked for the recipe. She had found it in Pirkka magazine, and told me that my grandmother used to make this herring each Christmas, but because mom didn’t like it when she was young, she didn’t carry on the tradition. “Better late than never” I thought earlier today and headed to a grocery store to buy some herring fillets. Luckily I have been saving some used glass jars which made this ex tempore preserving session that much easier. You can use either whole fresh or salted herrings, but those have a ton of bones to be removed, or be a wimp like me and buy boneless, skinned fillets. Many herrings are very heavily salted and must be soaked before use. Mix sugar, vinegar and water and bring to boil. Let cool. Boil the jars and lids to clean them thoroughly, or bake in 125°C (260°F) oven for 15+ minutes. Peel onions, carrots and horseradish and slice them very thin. Rinse the herring fillets with running water and pat dry with tissue. Cut them in 2 cm slices (slightly less than 1″). Fill the jars with the ingredients in layers, adding a few laurel leaves and a small handful of black peppers per jar. Top up with chilled sugar-vinegar solution. Mix the preservative (such as Atamon) in the liquid if you opt to use preservatives. Shake the jars to remove any air bubbles. Store in a fridge. N?ytt?? hyv?lt?! Sano Pillelle terveisi?. I do love herring (pickled or raw with onions)…wish I was there to taste it (along with the elk, some dallaspulla, and then maybe buy some Moomin things!). I’m sure Finand does really magical christmases! :) Happy holidays! hi there. really nice looking blog you got here. I added your blog as a link on mine. Hope you dun mind. Merry Christmas! Shaz, a foodie blogger from Singapore. I am delighted to find your site. I am an Ameri-Fin and love finding real authentic recipes I can read in English. Write on! Lovely site, tasteful layout, good food. What else you gonna need? Anyway, just wanted to let you know I put a link to your site on our blog about what to eat in Helsinki for lunch. You’re welcome to do the same if you think it fine. I would like to know if there are any Finnish restaurants in the U.S., particularly, on East Coast, Chicago, California, or Pacific Northwest. Nyt jos teill?k? ?n ei ole vastausta t?h?n seuraavaan kysymykseen niin masennun. Mill? voi korvata Monterey Jackin? Mit? se vastaa t??ll? Suomesta saatavista juustoista? Netti on ihan turha t?h?n, jokapaikassa lukee vaan “pehme? ja mieto”. Aika moni juusto on pehme? ja mieto. i adore pickled veggies. i just returned from Poland and it’s about all I ate for two weeks!! How long will the herring last in the jar? I too love pickled fish. The only problem is that I live in the U.S. and don’t have access to herring. Could I make the glassmaster’s pickled herring with some other type of fish?? I live near the U.S. Great Lakes and can easily obtain perch, walleye, and pike.